I would like to know if I can use my old passport to cross the border while the renewal one is in process? I need to cross the border everyday for work. Yes you can, in fact, use your old passport. There's an option on the form asking if you'd like to keep it. It's "stamped VOID" and "hole punched" but you can use it WITH the white receipt. You can't travel international but you can travel North America. My son and I did it yesterday. WE just renewed ours two days ago and the old ones were invalidated on the spot. In fact, they have a machine that uses small spikes to punch right through the passport the phrase " VOID/NUL"
Further to my last comment, I would suggest that you query your local passport office to find out if there are temporary documents available or if there are exceptions to nullifying the passport if you still need one for work purposes. 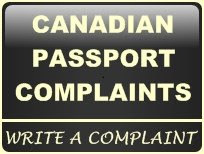 is there a phone number to contact the passport place? not the 1-800 one as that one is just a bunch of recordings. Call the 800 # and choose from one of the 6 (?) options. At that time you are able to press 0 and speak to a human. You may have to listen to the options twice. I'm renewing my passport. Do I need to have someone sign my passport photo??? Thanks!! You do not need to have it notorized for a renewal. You can sign it yourself if you're over 18. You do not need to have someone sign your picture for a renewal, you sign it yourself. Call the 800 # and choose from one of the 6 (?) options. At that time you are able to press 0 and speak to a human. I heard that there is someone taking passport photos in the Windsor location. Can anyone confirm that?